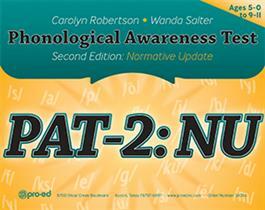 The PAT-2:NU is a standardized assessment of phonological awareness, phoneme-grapheme correspondence, and phonemic decoding skills. Test results help educators focus on those aspects of oral language that may not be systematically targeted in classroom reading instruction. The test has six core subtests (Rhyming, Segmentation, Isolation, Deletion, Substitution, and Blending) that measure students' awareness of spoken syllables and phonemes in students ages 5 through 9 years of age. The test also has two supplemental subtests (Phoneme-Grapheme Correspondence and Phonemic Decoding) that measure students' knowledge of sound/symbol correspondence in isolation and in practice in students ages six years through nine years. The test is comprehensive and includes a wide variety of tasks; performance on each of these tasks has been correlated with success in early reading and spelling. The straightforward, developmental format lets you easily tease out specific skills and plan effective interventions. Characteristics of the normative sample were stratified by age relative to region, gender, ethnicity, and socioeconomic factors, and other critical variables are the same as those reported for the school-age population reported the Statistical Abstract of the United States 2016 (ProQuest, LLC, 2016). Each item on the test was evaluated using both conventional item analysis to choose good items and differential analyses to find and eliminate potentially biased items. The subtests and composite scores were thoroughly examined for floor and ceiling effects. Criterion-prediction validity is evidenced by correlations with, and comparison of mean and standard deviations of, the CTOPP-2 Phonological Awareness Composite Score. New normative scores for the subtests were calculated in terms of scaled scores that have a mean of 10 and a standard deviation of 3. The Total Score was divided into the Phonological Awareness Index and the Phoneme-Grapheme Index. These scores are calculated as composite scores (another type of standard score) with a mean of 100 and a standard deviation of 15. The composites reflect direct linear transformations of the sums of scaled scores and give equal weight to each of the subtests that comprise the Phonological Awareness Index and Phoneme-Grapheme Index. The Examiner's Manual was reorganized and rewritten to provide more detailed information on the administration, interpretation, and statistical characteristics of the test. The PAT-2:NU consists of five components: an Examiner's Manual, Examiner Record Booklets, Manipulative Blocks, a Phoneme-Grapheme Correspondence Stimuli Booklet, and a Phonemic Decoding Stimuli Booklet. The Examiner's Manual includes a comprehensive discussion of the test's theoretical and research-based foundation, item development, standardization, administration and scoring procedures, norm tables, and guidelines for using and interpreting the test's results. The Examiner Record Booklet provides space to record responses; transform raw scores to age equivalents, percentile ranks, and scaled scores; and calculate the Phonological Awareness Index and the Phoneme-Grapheme Index. The test kit also includes Manipulative Blocks for the Substitution subtest, a stimuli book that includes the items for the Phoneme-Grapheme Correspondence subtest, and a stimuli book that includes the items for the Phonemic Decoding subtest. Reliability and validity studies were conducted with individuals with typical language ability and individuals who had be previously diagnosed with a language impairment or received other special education services. The average coefficient alpha ranges between .83 and .92 for the subtests and is .96 for the Phonological Awareness Index and .97 for the Phoneme-Grapheme Index. Validity of the test composites was demonstrated by correlations to the CTOPP-2 Phonological Awareness Composite. The coefficient for the Phonological Awareness Index was .92, and the coefficient for the Phoneme-Grapheme Index was .94, both nearly perfect.